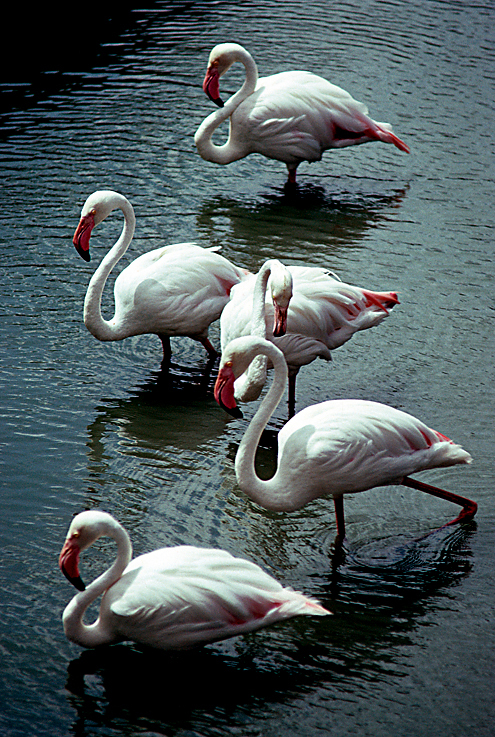 I believe I shot this image of flamingos at the Gladys Porter Zoo in Brownsville, Texas. I’ve always loved this composition, and it was one of my first images I selected to send to ScanCafe. Notice the “S-curve” composition? Interesting Sidebar: I read on Wikipedia that “a well-fed, healthy flamingo is more vibrantly colored and thus a more desirable mate; a white or pale flamingo, however, is usually unhealthy or malnourished. Captive flamingos are a notable exception; many turn a pale pink as they are not fed carotene at levels comparable to the wild.” The amount of pigment laid down in the feathers depends on the quantity of pigment in the flamingo’s diet. An absence of carotenoids in its food will result in new feather growth that is very pale; the existing pigment is lost through molting. Flamingos in captivity require a special diet to ensure they preserve their striking colors. Happy birthday, girl with the pearl earring! The girl with the pearl earring is my longtime and very dear friend, Karen. This past Friday was her 29th birthday (again). The years have been very kind to her—she is just as lovely today as she was when I photographed her so many years ago. And now she has two very photogenic daughters for me to capture! Anytime you notice an S-curve in your composition, relish it! 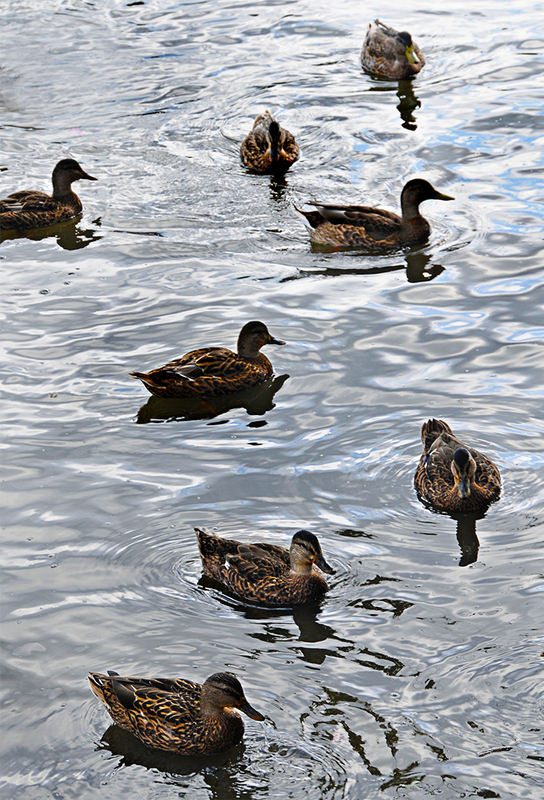 An S-curve is an imaginary line in a photograph that resembles the letter “s.” This serendipitous composition of ducks leads the viewer in at the top, meanders into the middle, then curves back out again—which adds motion to the image. Look for opportunities to utilize the S-curve’s soft, flowing lines to help create separation in a frame or make the S-curve your focal point. And don’t stop with landscape photography—the S-curve can be used in posing subjects for portrait photography as well. Re-post: Okay. Are you leaving enough room above my head? Yes? Me, always with a camera bag on my shoulder (this one was a Domke bag—that I still own—that my friend and fellow photographer D.B. gave me when I worked in the ad department at Giant Food after I moved here from Texas), circa way long ago. Maybe late 80s? Dig those big round pre-Harry-Potter-esque glasses! It would not be a stretch to surmise that my sometimes-closeted love for my beloved John Denver influenced my choice in eyewear. Hey, look at that girl with the big glasses—she must be really, really smart! And dig those paper-bag styled shorts (I be stylin’)! I had read in a Cosmo magazine that the color peach makes you look dewy and youthful. I think I wore peach at every turn after that, because if Cosmo prints it, it must be true. Oh, and this was definitely “the era of the perm.” Even the guy on my right is mesmerized by me. This was most likely shot on the beach on Assateague Island in Maryland…obviously by someone who was either a) inebriated, b) suffering from vertigo or c) truly horrible at composition. Hmmm…I think it was shot by new-boyfriend-Dave-who-obviously-loved-me-despite-my-flesh-colored-face-enveloping glasses. No matter. It’s a record shot of a recorder. And a happy one at that. 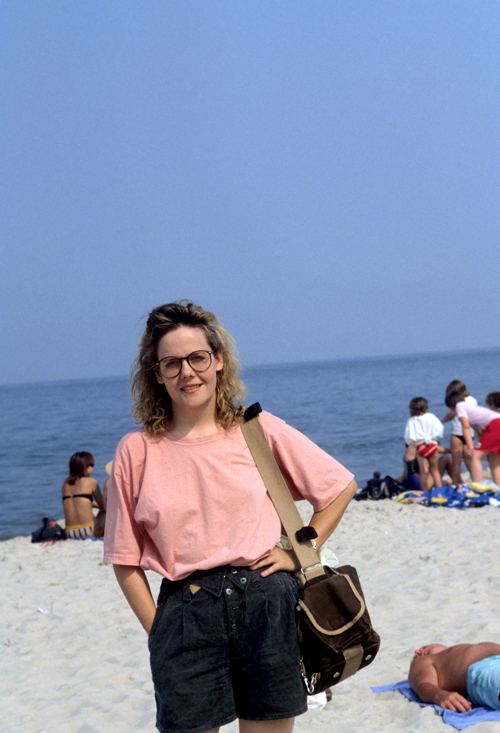 I remember when I first had to get glasses—I’m guessing it was around 1987. I wasn’t the least bit happy about it and didn’t want to spend a penny more than I had to. So I bought the ugliest, cheapest, completely utilitarian, fleshy-pink giant frames I could find. Apparently I figured that since I had already won Dave’s affections, he wouldn’t care what my glasses looked like. They were functional and I could see Hecht’s red dot sale signs from a mile away! When I look back on these old photos like this, I wonder what he really thought. What’s even funnier is, I eventually swapped the flesh frames for these faux tortoise beauties, but they were still atrocious, still oversized, still from the wall ‘o utilitarian frames. I remember when I got my first pair of non-John-Denver-schoolboy-all-growed-up frames. After watching me shop for yet another of my comforting old lady specs, she said, “Um. Miss? Why don’t you try these?” They were very small. Very little glass. Pert. Prim. Shimmery metal. Calvin Klein. $175 (gulp) just for the frames. To humor her, I tried them on. Cute. But really? Could I be so brave to leave my studious-nerdy-why-don’t-you-just-get-some-that-cover-your-chin-as-well frame choices behind? Dare I? Yes, I could and I did. And after adding the super deluxe scratch resistant, sun-shielding, UV-UVA-SUV-ASAP-LMNOP coating, radon-deflecting, night-vision-enhanced, argon-gas-infused lens package, I left with those teeny, tiny little designer frames for only $330! Contrast that to my first old lady frames that cost a whopping total of $50 and came with lenses, a cleaning kit, and an eyeglass holder. Ah, but I did look so stylish after that. Nothing came between me and my Calvins. I haven’t looked back. Until I stumbled onto this slide, that is. I took this shot in Montana on the road between Gallatin Gateway (where Michael’s Aunt Jackie lives) and the entrance to Yellowstone National Park. We were spending Christmas at Jackie’s, along with two of Michael’s sisters and their families, in 1995. This trip included my first try at snowshoes (awkward, as expected), hiking up a mountain to find a Christmas tree Jackie had picked out (ask me about that adventure sometime), the snowmobile-on-frozen-lake-ice-fishing excursion (no luck for anyone), a fun (but very bumpy) snow coach ride with everyone through Yellowstone the day after Christmas (a gift from Aunt Jackie), me suddenly sinking waist deep in snow (along with Michael’s brother-in-law, Pete) while we were trying to get that perfect landscape shot (but we saved the cameras! 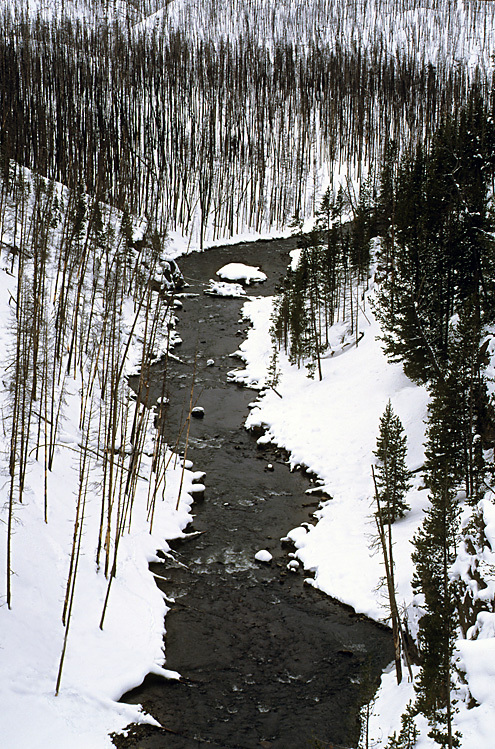 ), a sightseeing/shopping trip to Bozeman, and more cold and snow than you could possibly imagine. I probably shot this image with my N90s. I also brought along my Fuji G617 panoramic camera—I’ll have to find those really wide transparencies and get them scanned some day.